If you’re like most people, you get out of bed in the morning and head in whatever direction the day takes you. This is largely accomplished through walking from one place to another. Walking is very much automatic, and you likely take it for granted. Most of us do. You have muscles in your legs that you probably will never be aware of unless you experience a problem with one or more and need medical attention. Below we will discuss the muscles in your lower leg that allow you to do your daily work and play. The P. Tertius muscle is also called the fibularis tertius. It is located on the front of your lower leg. It is attached to your fibula, one of the two major bones in your lower leg. It assists your toes’ movement toward the shin, in a movement known as dorsiflexion. It directs your foot away from the center of your body in a movement known as eversion. 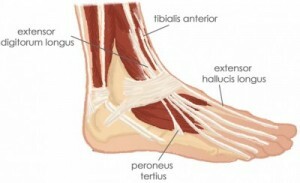 If you experience a problem with the Peroneus Tertius, it shows up as pain in your ankle and heel. If you experience this type of pain, apply ice to the area and take a non-steroidal anti-inflammatory drug (NSAID) like ibuprofen or aspirin to relieve the pain. The T. Anterior muscle is the largest in this muscle group. The blood flow for it is supplied by the tiberial artery. This muscle helps your foot in flexing forward from the ankle, and also allows for extension of your toes. It comes from your shin bone and joins the first metatarsal bone, right behind your big toe. The task of this muscle is stretching out your big toe. In addition, it helps in directing the toes, so they’re closest to your shins. 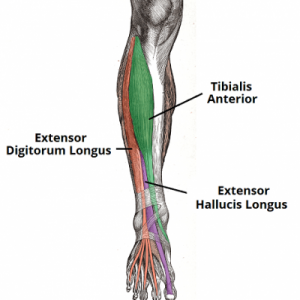 The Extensor Hallucis Longus assists in inversion of your feet. That occurs when your foot is shifted to the outer edge. If this muscle is injured or otherwise compromised, it can affect the way you walk, since it regulates much of the movement of your big toes. This muscle, from its position in the anterior (front) of your leg, has the task of extending your foot from the ankle. It also allows you to move all but the big toe. If you have strained this muscle, it will be felt most when you attempt to go up a set of stairs. Regular stretching of your shin will aid in the prevention of inflammation. Raising the toes in an exercise can also help keep this muscle in good shape. 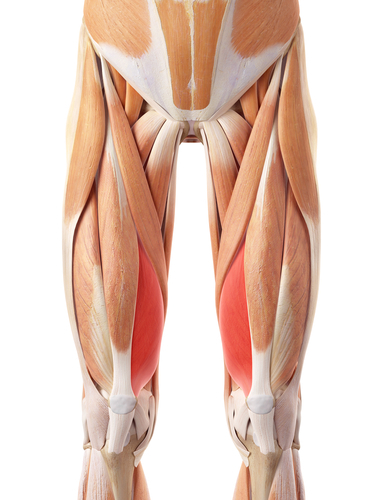 This part of your lower leg, in the back, includes seven muscles that are separated into deep and superficial muscles. Your deep muscles are found within the back of your leg. The popliteus muscle works with the knee, and the others assist in moving your ankle and foot. This important muscle is found towards the side of your leg. It is responsible for moving your big toe. It attaches to the large toe plantar and helps that area to flex. This is a smaller muscle, located on the back of your leg, in the midsection of it. It begins at the tibia and then joins with the plantar surface, which attaches all but your big toes. It helps these toes to flex. The deepest of these four muscles, this is located between the flexor digitorum and the flexor hallucis longus. It begins at the membrane between the tibia and fibula, in the back of these bones. It helps to invert your foot and keeps your medial arch intact. This muscle rotates the femur in a lateral motion so that you can unlock your knee joints for ease of movement. It is found just behind your knee. These muscles together form the calf, on the back of your leg. They run from the calcaneal tendon to the heel. Two tendons help in cutting down any friction these movements cause. This is a slender, small muscle that travels down your leg, and it may sometimes be mistaken for a nerve, due to its size. It begins at your ankle, and, while it travels across your knee, it isn’t responsible for major movement. Found in two parts, the Gastrocnemius has a medial and lateral portion. They meet to form one muscle. This muscle is the one you use for forceful movements. If you’re jumping or running, this muscle is working properly. 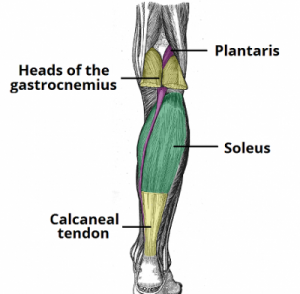 The soleus muscle is located inside your gastrocnemius muscle. It is large and flat, and in appearance resembles a flat fish. It allows the plantar flexing of your foot from your ankle joint. The soleus and gastrocnemius muscles each taper, and then merge with one another at the calf muscle base. There are tough connective tissues there that merge with your Achilles tendon. Then, the Achilles is found inserted into your heel bone. If you are jumping, walking or running, your calf muscle and these two parts, pull your heel up, allowing forward movement. 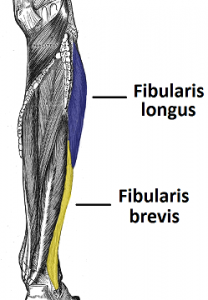 The lateral part of your leg contains two muscles, the fibularis longus and fibularis brevis. They work in unison in helping your foot to turn sideways, when you need it to. This is the longer of these two fibularis muscles. It charts an odd course through your leg. It begins in the lateral part of the tibial condyle and fibula. The fibers of the fibularis longus join a tendon that then gravitates toward your foot. It crosses beneath your foot, and attaches to the metatarsal base. This muscle allows you to arch your foot. 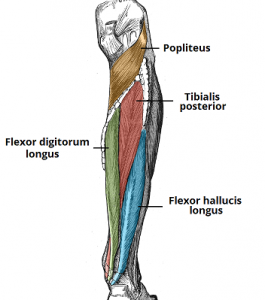 This is the smaller, deeper counterpart to the fibularis longus. It begins at the fibular shaft surface and evolves into the form of a tendon that travels to the base of your foot. It helps your foot to turn sideways. This muscle ends at the fifth metatarsal.